HARGEISA– Somaliland house of national assembly on Saturday session passed the 2019 national annual budget. The house speaker, Hon. Bashe Mohamed Farah presided over where 60 lawmakers have attended the session this morning. 46 members of the parliament have voted in favor of passing the budget whereby 12 members have rejected and 2 abstained. The house speaker, Hon. 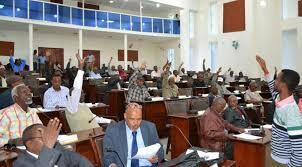 Bashe has informed fellow lawmakers that the parliament will be in recess for the two months to come. The minister of finance has presented the national budget before the parliament.